For me the dojo is a sacred space, sacred in the personal sense, a place which is a refuge from my cares and worries as I leave them at the door. 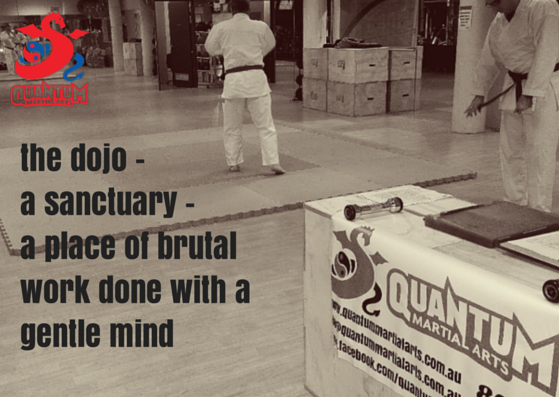 What does ‘the dojo’ mean for you? It’s somewhere I can shed the day, part of the reason why I love the evening sessions. When you first start you just don’t have time to think about anything but the class, but eventually your brain just shuts the day down and starts to anticipate the joy of the martial movement the second you cross the threshold. The dojo is a place for moving meditation and focus. It’s also a great place to make friends with like minded people. There are no passengers in the dojo!